Uptown Beer Garden is a popular spot for drinks after work. Uptown Beer Garden will host a grand opening party for the 2017 season on Thursday, May 11. During the event, which is free to attend, the beer garden will serve complimentary bites from the new summer menu. Drink specials, like $5 cocktails, $4 wine and $3 beer, will be available during happy hour, from 5-7 p.m.
New this year, the large 9,000-square-foot space will have more seating and more bars. Uptown gets crowded during the summer, so hopefully the new layout helps guests move throughout more easily. 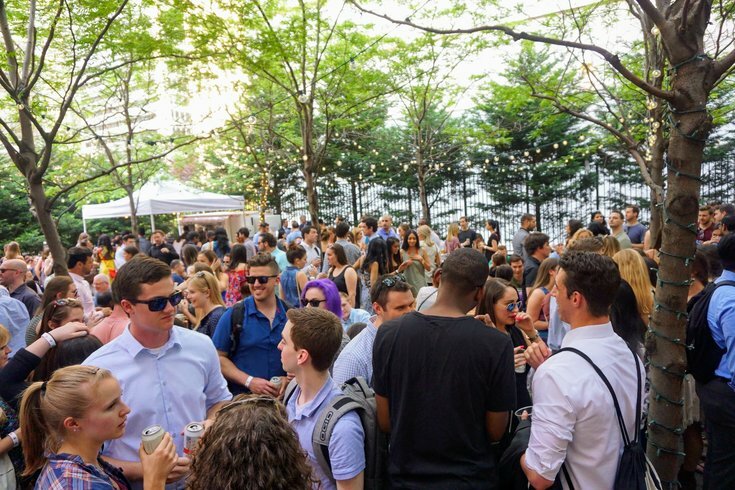 The beer garden is located at 1735 JFK Blvd., in the courtyard of the BNY Mellon Building. Look for the light-up "Uptown" sign outside.